The Story of Momos: What Makes This Tibetan Dumpling So Popular? - Integration Through Media ....! 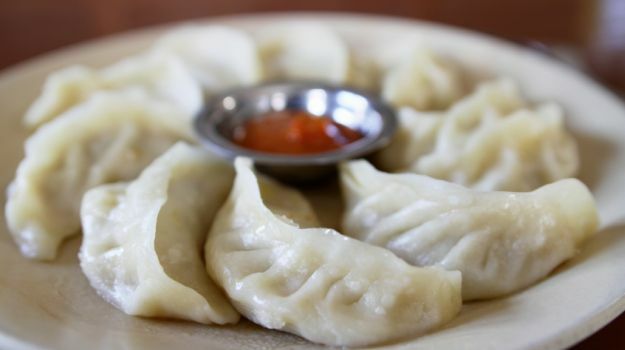 The Story of Momos: What Makes This Tibetan Dumpling So Popular? Have you ever wondered about the journey of momo? Come to think of it, the momo has probably travelled the farthest of all foods. That, it is now quite at home on the streets of Delhi, as it is comfortable at posh five-star eateries, only confirms how these stuffed dumplings (either with meat of one’s choice or assorted greens including paneer) have evolved over the years. And how India, which is not even its place of origin, has adopted it like its very own is also an interesting twist. Today, there are food entrepreneurs who prepare momos in bulk and supply them to vendors and kiosks whose only job is to steam and sell them piping hot with hot sauce to hungry customers who never seem to get enough of them. There was a time, not too long ago, when people associated momos with food from the Northeast. Far from it, it’s not really a part of their traditional cuisine. For instance, in Manipur’s capital Imphal, restaurants may now be awaking up to the popularity of this food and including them in their menu with passion, but they can never get it right simply because it is not a traditional dish like fish and rice is, as in the case in Tripura or other states in the region, with of course a few exceptions. Shillong is one place where it’s easy to get some of the most delicious dumplings as compared to the other states. Expect meaty fillings in creamy, light shells with spicy chutney to go with it. No, it is not at all part of the local Khasi cuisine. Rather credit must be given to the Chinese community who have made Shillong their home and introduced Chinese food, including momos (traditionally Tibetan). Perhaps it is only among Arunachal Pradesh’s Monpa and Sherdukpa tribes, who live in the West Kameng and Tawang districts and share a border with Tibet, where momos are a part of their diets. Their version is usually stuffed with minced pork and mustard leaves or other green vegetables, and served with chilli paste. How momos are received in Sikkim is quite another story. Across the communities: Bhutias, Lepchas and Nepalis, it is a comfort food which is very much a part of their diet. Their aluminium momo steamer is always in use. The dumpling you get in Sikkim is a close cousin of the Tibetan momo. The great exodus from their homeland in the 1960s scattered Tibetans and their cuisine across India — several settled in Sikkim, Meghalaya, the hill towns of Darjeeling and Kalimpong in Bengal, and Delhi. In Sikkim, the momo has pushed the state’s traditional dish, hyontoen, off the plate. Hyontoen is made of millet flour, rolled like momos, stuffed with cheese and steamed. Today, few Sikkimese people remember it but they take pride in their ability to prepare batches of delicious momos. At home and in some restaurants, it is served with radish or cucumber salad. Beef and pork are traditional fillings; but chicken and vegetable momos and cottage cheese of late, are gaining ground. But the provenance of the Indian dumpling is a complicated one. Where and how did it feature into our menu is interesting. 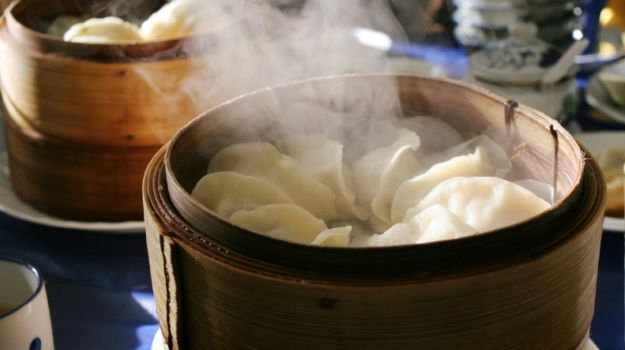 Even though momo traces its roots to Nepal, Tibet and Bhutan, it is similar to what the Chinese call baozi and jiaoz. Both are dumplings that are stuffed with pork, beef, shrimp, vegetables or even tofu. Though these are integral to the Chinese, it is commonly found in most parts of Asia. For the Chinese, special occasions like their Lunar New Year means getting their kitchen stuffed with ingredients for jiaozi, which is lovingly prepared in every home. In Tibet, where it is considered an unofficial national dish, momos come with various fillings. They are also steamed and fried and savoured with accompaniments like hot sauce that’s made with tomatoes, garlic, ginger, dried chillies, oil and tossed and blended together. So what the Tibetans called momos is nothing but dim sum for the Chinese. Momos have also made passionate inroads in Bhutan believed to be popularised by the Tibetan communities. So, it’s interesting how my Bhutanese friends interpret their version. They use all kinds of meat, mostly yak meat or beef, for the stuffing. As for the vegetarian option, they stick to cabbage, mushroom,paneer, potatoes and spinach with loads of onions, cheese, butter or oil and of course, salt to taste. For the sauce, it has to be that deadly dalley chilles, locally called dalley khorsani. ‘Dalley’ in Nepali means round, and ‘khorsani’ is chilli. They would grind this chilli with sliced onion and tomatoes, mash it to make a course paste, and finally garnish with minced onions and black pepper. Sometimes, they also add in Bhutanese pepper, which tickles the tongue. The bones of any meat they use are dunked in a pot and kept to boil for a clear soup. What Makes a Delicious Momo? So, what makes a delicious momo really depends on how it is prepared and what ingredients are used. 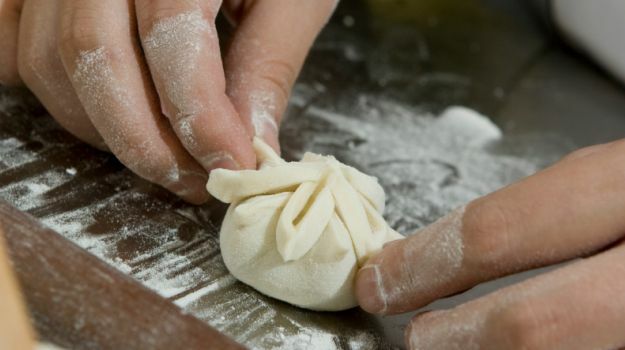 If the dough, for instance, is fresh and of fine quality, be sure that you will get a good momo. Some people even use warm water when kneading the dough. The stuffing, be it meat or vegetables, should be minced well and flavoured with ginger or garlic. One of the most delicious momos I have ever had was at the now-closed-for-renovation The Oberoi Delhi’s iconic Taipan. The juicy stuffing of shrimps, fish, chicken and vegetables come wrapped in a flimsy exterior of finest imported flour, in a bamboo basket. A mere bite and the juice just oozes out and what accentuates the flavour are the many accompanying sauces. 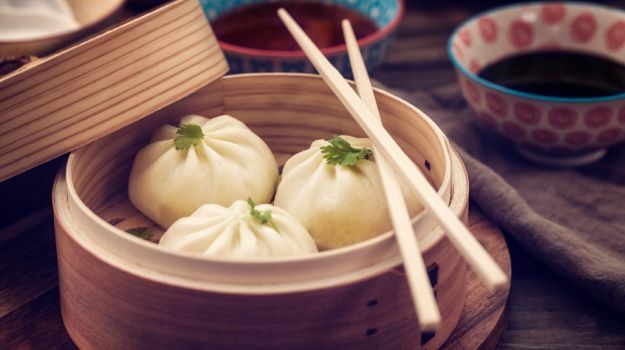 And many chefs often say the real trick of a momo or a dim sum is the dough – it must be so fine that when steamed, it gets only finer and not thicker. From glass noodle turnip dumpling to spinach, water chestnut and black bean dumpling, the variations were like art. Another time, it was at a Ladakhi friend, Angmo’s home in Delhi. Straight out from a boarding school, she led a group of hungry hostellers into her kitchen. Painstakingly, she kneaded the dough and prepared mutton momos in her aluminium vessel. She deboned the meat and dunked them into a pressure cooker. After a couple of whistles, added sliced coriander and garlic. The aroma wafting all over her house was enough to rev our appetite. Those juicy momos with a home-made sauce of tomato, green chillies and garlic, along with a bowl of soup was soulful. To this day, I long for that. Momos, no matter where they come from, they will always be my soul food. About the Author: Hoihnu Hauzel is a journalist and a food & travel writer. She spent over 15 years reporting and writing extensively on travel, hospitality and lifestyle for different leading dailies, untill she decided to pursue an independent writing career. Her book, The Essential Northeast Cookbook, published by Penguin, has been instrumental in introducing and popularising Northeast cuisine outside the region. She is particularly keen on food history linked with customs and traditions of the people of Northeast.